Winter in our area isn’t over yet. The last frost day is still more than two months away. But spring is coming and with it the next growing season! 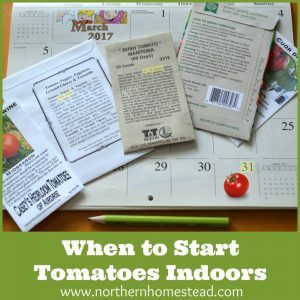 Starting seeds indoors is the start for a new garden season. Why we do things depends on what we want to achieve. What is the outcome not just the activities? 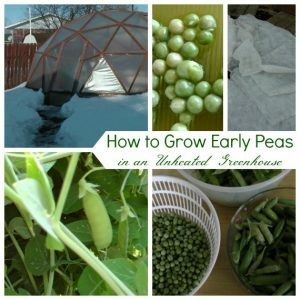 If we start seeds to have seedlings, to have an early start, or to grow a garden, those are all activities, not the outcome. Personally, we start seed to have homegrown organic food for a healthy diet and life. In order to achieve that healthy life, we have to have seedlings for the new growing season. Growing plants from seed is a lot of fun. I am always amazed at the miracle of life, how out of a dry little something (seed) a new plant grows and produces delicious fruits that contain the same seed to produce new plants. To start plants from seed also saves money. It isn’t a lot of work, but you can start a lot of seedlings yourself for the price of buying one plant. Seed starting pots or propagation trays come in all sizes and shapes. If you want to avoid plastic you can also build your own pots out of newspapers or avoid pots altogether by using a soil block maker. There are also peat moss pots available, but from our experience, they don’t work so well. Maybe because our climate is too dry. We use small planters (often recycled from plants we have bought here and there) for plants that are not staying inside long: like cabbage or lettuce. For peppers and tomatoes, we mostly use the (free) yogurt containers. It seems like they have the optimal size for those plants and save me some replanting work. Recycled toilet paper tubes make great planters for cucumbers. They can be planted with the seedling into the ground, so you don’t disturb the roots. For squash and bigger plants, we use a bigger container so that the roots have more room to grow and are not disturbed by transplanting. Propagation seed starter trays are great if you just want a start on plants like lettuce, chard, beats etc. 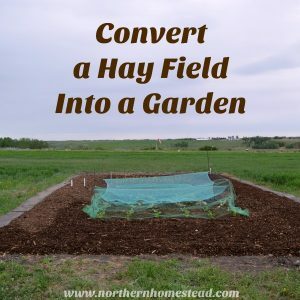 As in most cases with gardening, we encourage you to keep things simple and doable. Plants will grow in whatever pots you start them in. If you want to be specific, you can, but there is no real need for that. The one thing that we would recommend is sturdy planter trays. They do make life easier to handle many seedlings at once. We also grow microgreens in them all winter long, so it sure is worth it to have them. For sowing seeds in seed trays to prick them out later, we recycle containers from the kitchen. 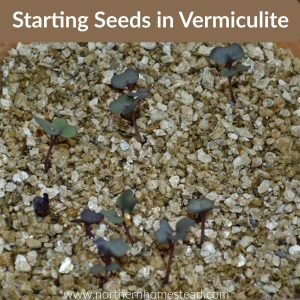 We also like to use vermiculite instead of soil for this. We have a whole blog post about it, to learn more go here. The seed starter potting soil is important. You want good light soil. We like the Sunshine mix potting soil for seed starting. You can use advanced, or professional mix, as well as all-purpose. #4 is suitable for organic gardening. In Canada, we order the Sunshine potting soil through a local Home&Hardware store. 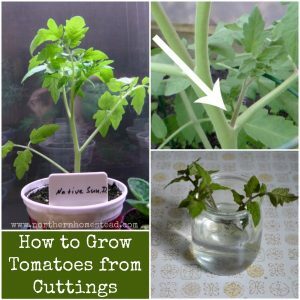 It is a great soil for anything and everything you want to grow in containers, not just seedlings. 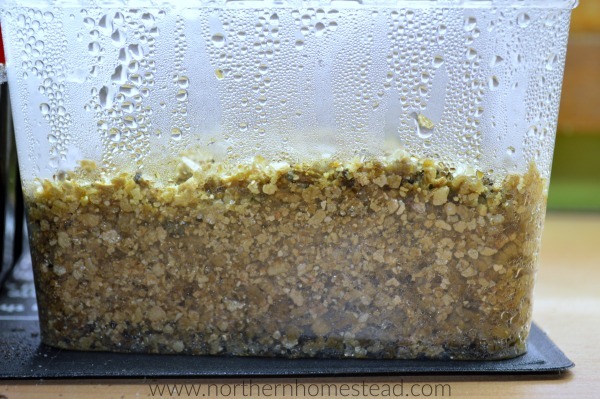 Some growers like to mix worm casting compost into the seed starter soil which is a good idea. We like to add the worm casting to the planting hole when planting the tomato, pepper, and other heavy feeder seedlings out. This way we give the seedlings a boost when it’s most needed. Either way, natural compost is good for plants. However, we don’t recommend using enriched potting soil. The chemical fertilizers only give the plant a very fast start, but then the plant tends to ask for more. 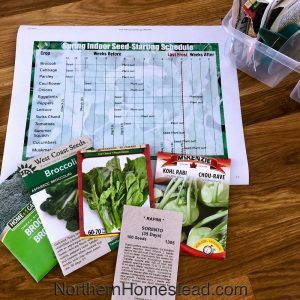 We have lots of information on getting seeds for the new growing season. As well as plant varieties we grow in our short growing season. Labeling is important so you know what varieties you are actually growing. It does not matter what kind of labels you use. Garden labels are great, but a plastic spoon works just as well. Also, a garden notebook is a helpful gardening tool. For germination, a seed needs moisture and nice warm temperatures, but not so much light. As soon as the seeds are up, young plants need a lot of light. A south-facing window might be all you need. An east or west facing window would be better with supplemental light. 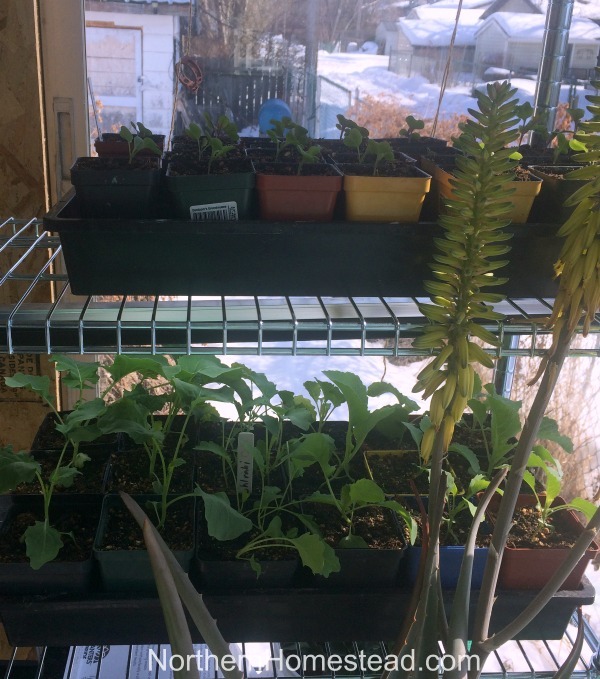 A north window is not a good choice for seedlings. With a grow light you can start seedlings anywhere in the house, and it also helps to supplement the light you have so that the seedlings don’t become spindly. As we already mentioned seeds need warm temperatures to germinate, so find a warm spot in your house. The top of a fridge would be a better place than a cold but bright window. Placing the tray on top of a heating vent in the winter is great too. You want about 85F degrees for fast germination. A Germination Station with Heat Mat can be helpful. After germinating not all seedlings like it warm. Winter crops like the cabbage family like it rather cool. We find they do better in a sunny basement window or out in the garage greenhouse. 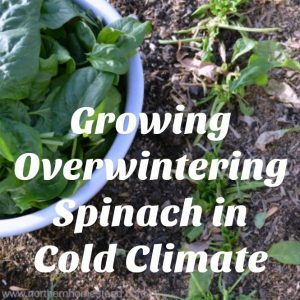 Check out winter sowing for cold weather crops as well. Fill a container with soil and compact it down slightly. You want your container to be filled without air pockets, but also not too compacted. If the soil is dry, now is a good time to water. Make sure the soil is moist before planting the seeds. Plant seeds no more than 3 times their size deep. Since we are indoors, they can be planted even more shallow. Only peas and beans do better well covered. But we usually don’t start them indoors anyway. 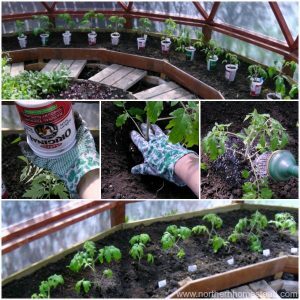 Plant 1-3 seeds for plants that grow best alone, like lettuce, tomatoes, and cabbage. Onions, beats and reddish love growing together as a cluster, start 4-6 seeds in one pot. After the seeds are covered spray them with water. In our dry climate, we also like to cover the pots with a plastic wrap to keep moisture in. Plants grow best when planted out small. It does not disturb the roots so much and it is much easier to plant. Some plants like lettuce only need about 3 weeks from seed to planting out. Peppers and eggplants need the longest, but we still like to plant them out before they put out buds. 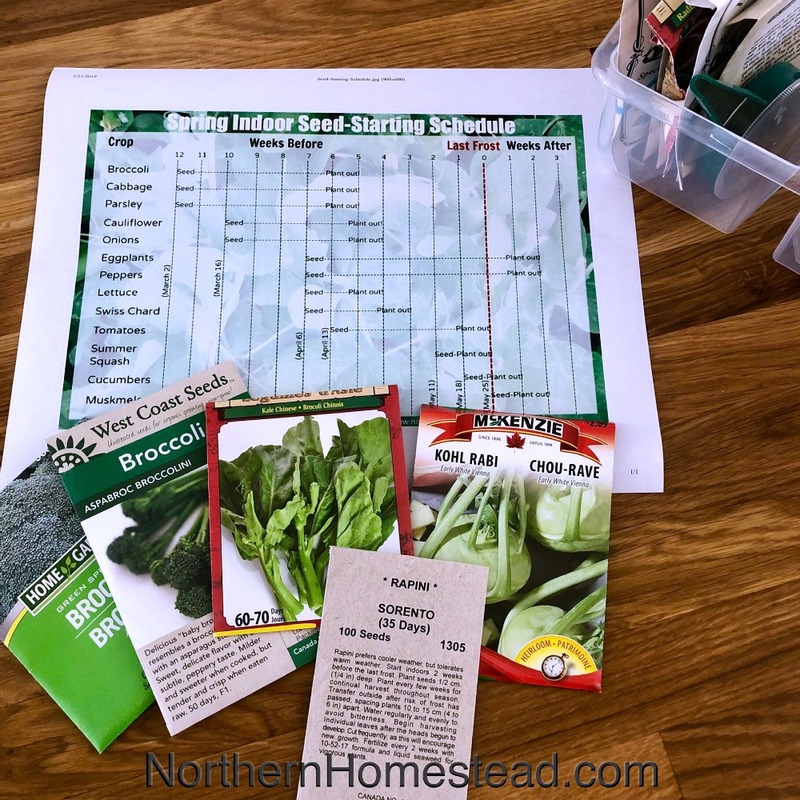 For a spring indoor seed-starting schedule and a free printable go here. Do you like to start your plants from seeds or would you rather buy seedlings? I really want to start some seeds inside. I love to watch things grow. And you make it look so easy. Well, it is easy ;). The main thing is – Just do it. I need to start some more too. So lets go to work! Keeping plants from pets is not easy. Good luck with it! This is good information. I’m really enjoying your site. I will be spending more time on it. Glad you enjoying it! Thank you for hosting! 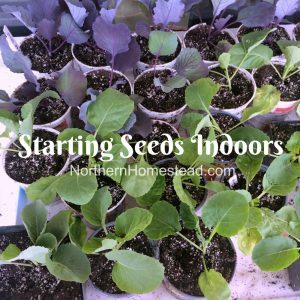 I always start seeds indoors, but usually end up buying some seedlings too. I live by the cutest nursery and never can resist the rows and rows of plants! I hear you, going to nursery’s is so fun, plus some plants just don’t start so well at home (maybe it’s just an excuse to buy them ;)). I hear you loud and clear on not being patient enough to wait. I usually start some seeds too soon, but that gets it out of my system. 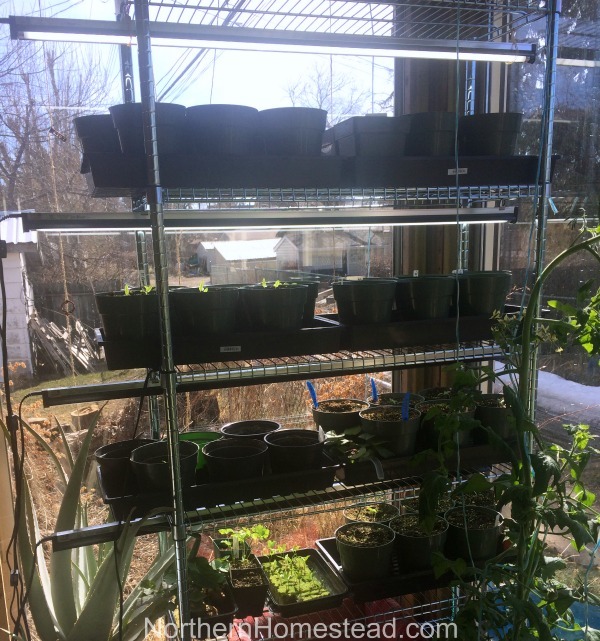 I started hundreds of hot peppers last month, leeks, edible flowers and am starting tomatoes tomorrow and the brassica family out in the unheated greenhouse tomorrow. It’s always reassuring to read other people’s posts to keep inspired and know we’re all on the right track. I’m frustrated by our -17C temp prediction for tonight – grrrr. -17C is to cold for my liking. But what can we do, right? WE just go with the weather. My cabbage is up and growing in the greenhouse, tomatoes have to wait. I now have the Tower Garden, that helps a lot, since I can grow year round. I started some seeds yesterday! Onions, leeks, peppers. 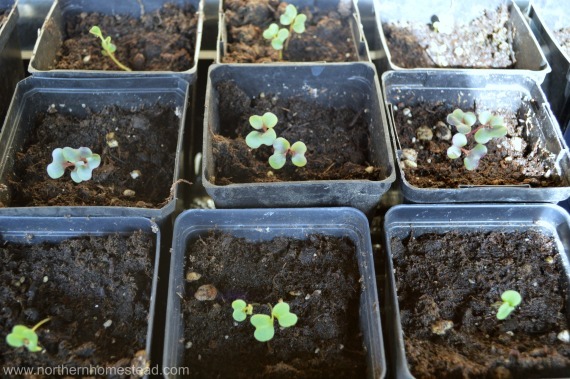 These all seem to take a long time to germinate in my house (wood stove – different heat zones) so I start them first. I’ve got 17 different kinds of peppers! I guess I got a little pepper happy when ordering seeds (in my defense, my daughter bought some of them, and they keep a few years so I’ve got a bit of a stash). The next thing I’ll start is parsley, celery, some annuals, sage, cabbage, cauliflower, brussels sprouts, broccoli, tomatoes, more flowers . . . more veggies, more herbs . . . my kitchen will soon be a mini-greenhouse. That sounds like a happy kitchen to me. Love how you adjust the schedule to your needs. 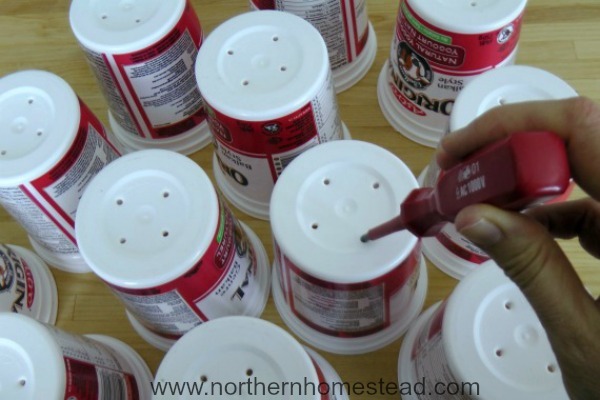 It is hard to give seed starting dates that are exactly for any situation. Usually it is the experience that teaches us when and how to do things. And I get the pepper happiness ;). Very informative article. We haven’t had a garden for the past 5 or 6 years, but planning on it this year. It’s a lot tougher to grow a garden with much success here in Montana than it was when we lived in Nebraska. 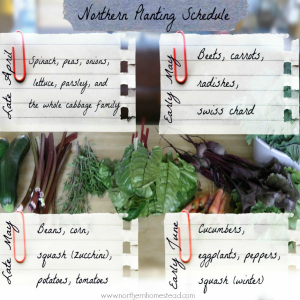 This planting calendar is just what I’ve been looking for – Thank you! You are welcome! Growing in cold climate is different, but once you get it, it’s just as much fun.